Month of April in Turkey – Tulips season Festival and the weather still cold. Very comfortable to explore Istanbul! If you’re lucky, you can still see snow in Cappadocia! For me, the best Istanbul Weather Turkey is definitely in April until early May! Because it’s Tulips Season, you can see many kinds of tulips in this country with many different form. Especially if you go to Emirgan Park. When Tulips Festival begin in Turkey, Emirgan Park is one of the most beautiful park in Turkey that decorated by various types of tulips. 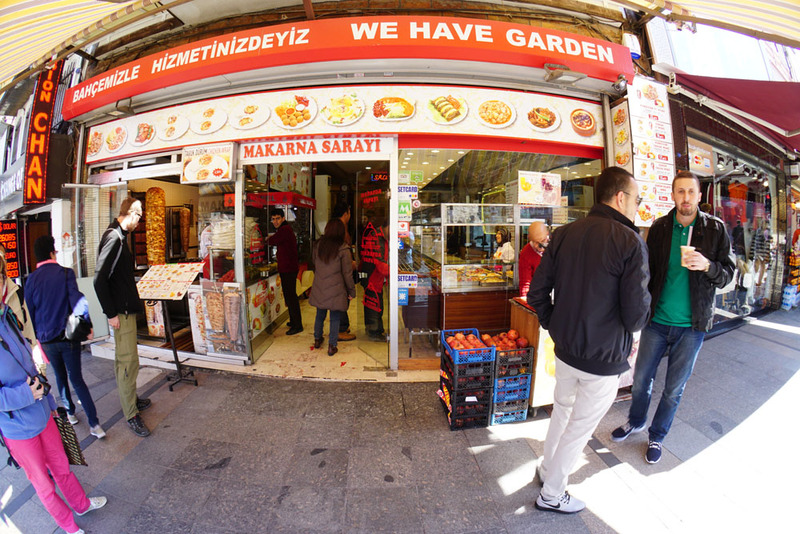 Beside Emirgan Park, you can also see various tulips in Sultanahmet Area. Tulips can be found in front of Blue Mosque and Hagia Sophia. Turkey weather in April is nice. Especially in Istanbul and other city, like Izmir, Cesme, or Selcuk. When I go to Turkey in 12 days, rainfall coming only in 1 day. There are no rain in the rest 11 days. Sunshine about 7-8 days in Istanbul, Izmir, Cesme and Selcuk. The rest of the day are a little bit cloudy. 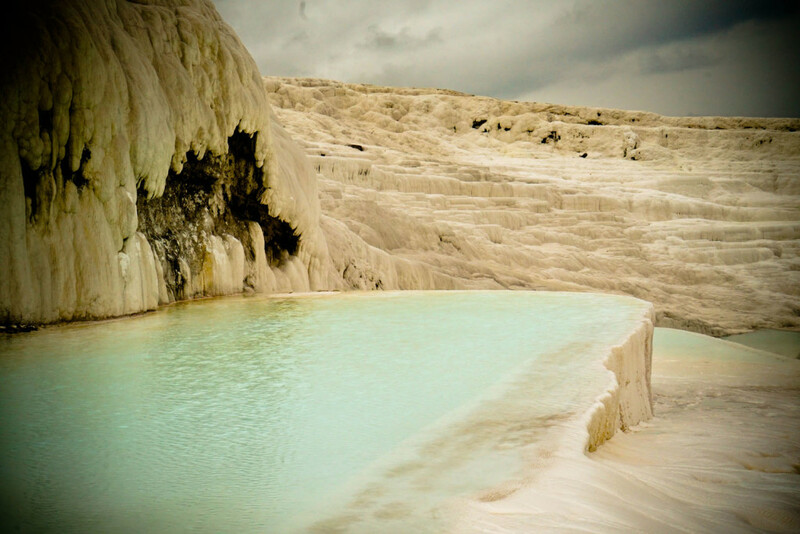 Especially in Turkey Central or East Turkey, like in Pamukkale and Cappadocia. 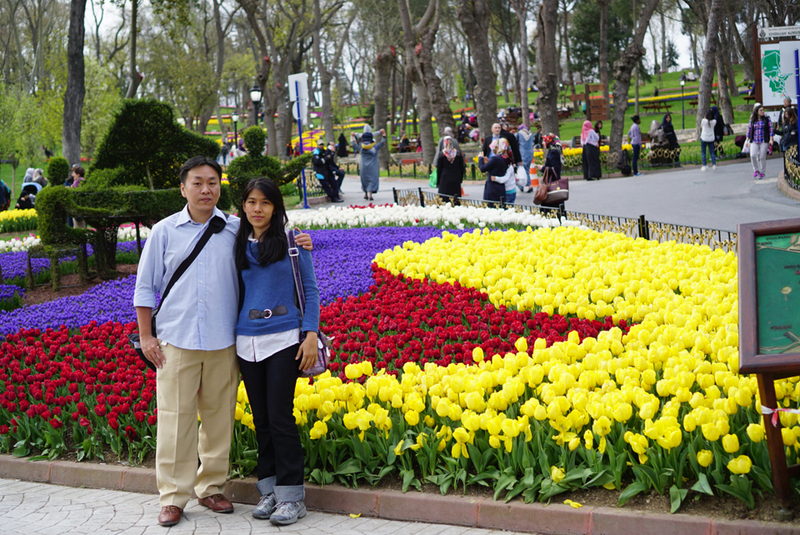 The most memorable of our trip in early April 2015 that we can experience two seasons, spring & winter season. Spring with a clear sky and tulips began to appear, and the winter where it is still snowing. Here are our story.. The first city in Turkey after Istanbul we go to Bursa. To the city of Bursa can be reached by ferry or bus from Istanbul. Lucky enough, snow resort Uludag included in our route are still covered by snow that has not melted. So we still had time to play in the snow. Heading into the resort Uludag snow peaks, we can feel the longest cable car ride in Turkey, along the 8.8 km. 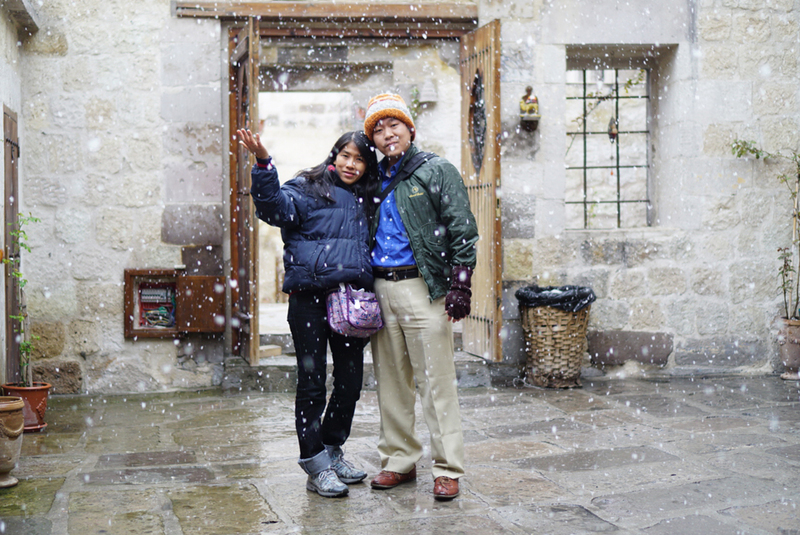 Better luck again, when we went to the town of Goreme – Cappadocia, it was still snowing. And we can feel for the first time, how the snow come down from the sky. During the first day in the Cappadocia region, it snowed all day. Satisfied being able to touch snow while seeing snow fall. Eventhough Cappadocia is cloudy and still very cold, I’m very happy because I experienced my first snow fall in Cappadocia! I already see snow before, but only in snow resort and not fall from the sky. Once back from Cappadocia to Istanbul using Pegasus Airlines (we get the promo price for Pegasus ticket), the next morning we were greeted with a friendly weather. The air is still cool enough, but the blue sky signifies the sun shines brightly. Tulips, the flower that is known in Turkey, also began to appear. The first day after the return to Istanbul, we headed to one of the famous parks in Turkey, Emirgan Park. There are tram route towards Kabatas station connected to the bus 25E toward Emirgan Park. Transportation within the city of Istanbul itself is quite easy. Like other major cities, the Istanbul metro (subway), tram and bus can reach almost all the main tourist attractions in the city of Istanbul. In Emirgan Park there are many variants of Tulip flowers, arranged in such a way that produces a variety of unique shapes. 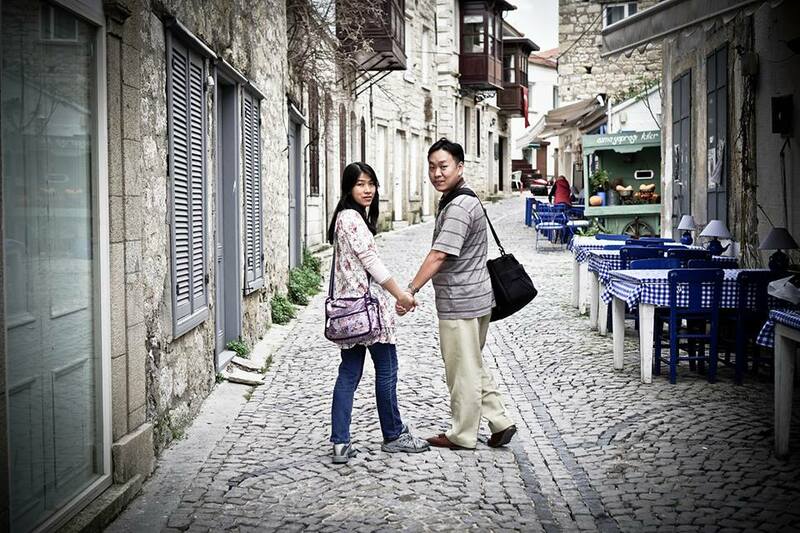 Very romantic and suitable to take pictures with your couple or family. Istanbul weather Turkey in April is very nice. Sunshine almost all day long, the Istanbul weather Turkey still cold not hot. So it’s the best weather I think to explore Istanbul. Also the Tulip Seasons Festival is coming! Getting to Emirgan Park is easy. You can combine Bosphorus Cruise with Emirgan Park in 1 day. Read our next blog post about Bosphorus Cruise & Emirgan Park Istanbul Turkey in 1 day. 20-30 lira admission main tourist attractions. Meanwhile, in a small town tourist attractions such as the castle in the town of Cesme only 8 lira. 10 lira Istanbul Kart. Able to ride a bus, tram and metro Istanbul. It can be recharged per 10 lira.